Daisy, who lives at no. 1 Magnolia Street, is perturbed because none of the neighbours ever talk to each other. They are certainly an eclectic lot – a grumpy old man, a woman with six children, a professor, three students, a black lady whose family all live in Australia, and a precocious little boy and his parents. 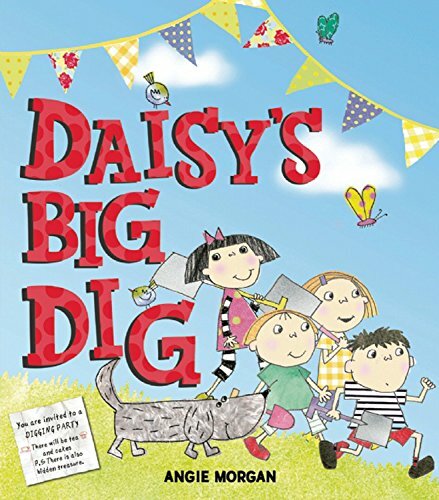 When the grumpy man, Mr Hofmeister, hurts his back and can’t dig his garden, Daisy and her best friend Lucy come up with a plan – a digging party for the whole street. They write proper invitations promising tea and cake and a ‘treasure’, and all the neighbours turn up. The digging gets done and everyone enjoys themselves immensely which means they become real neighbours and find out all the lovely things they can do to help each other. And the treasure? That you must find out! The illustrations are huge fun, so full of detail and charm. (Look out for the baby about to swallow a worm.) Ms Morgan works in pastels, watercolour and collage, and the vibrancy of the colours and the interesting design work make for a first-rate production.